This animation (and new works on canvas) were created onsite at Anno Domini in the days and nights prior to the exhibit opening on September 4th, 2009. Each of the 2136 frames in the animation were hand painted on three main exhibition walls, photographed and then digitally animated by Sam. Endika Currier (of San Jose’s Nu Class jazz group, Panthelion) composed the sound and musical score that accompanies the animation. (For the best audio experience listen with headphones). Sam3 (Elche, Spain - b. 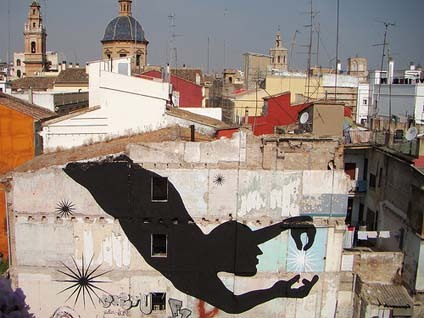 1980) is known for creating massive scale silhouettes in urban spaces. He refers to his dramatic black and white works as “shadows.” The absence of defining details in his paintings allows for him to not only work quickly, but also makes the message more accessible. His seemingly simple style is dense with profundity; the work is a reflection of the human condition as viewed through the experience of his global travels. Sam started drawing and painting at an early age. His first drawing classes were from a monk at the monastery near his home. When he was 13 he was fascinated with the graffiti culture in his small town and stole spraypaint from local shopkeepers (he was caught by police the first time he went out to write his moniker “BREAK.”) The following years were spent trading photos and zines with other graffiti artists through the mail. After graduating with a fine arts degree from a Granada university, he worked as waiter, a roadie, an illustrator in Barcelona, and then in animation in Madrid for a year before he “slammed the door on alienation” and abandoned the path of a corporate future. In 2006, Sam made a vow to dedicate his life to his art and has since created murals in 24 cities in 13 countries from Palestine to Brazil leaving metaphorical images that are to be deciphered and “owned” by the community. Exsitu Insitu is Sam3’s debut solo exhibition inside a gallery. The artwork for this exhibition will be made entirely on site at Anno Domini in the days and nights prior to his September 4th opening. Exhibit on view thru October 17, 2009 A.D.